The Thymio Challenge Activities Accessory Pack contains 30 challenges cards with increasing difficulty to discover the small programmable robot, accessories, a race track and a guide to know all about Thymio. The Thymio Challenge Activities Accessory Pack contains 30 challenges cards with increasing difficulty to discover the small programmable robot, accessories, a race track and an A2 guide to know all about Thymio. The challenge cards cover basic modes, visual programming (VPL) and advanced visual programming. The activity sheets make it possible to transform the robot, create obstacles and create the playground. Content in French, English, German and Italian. 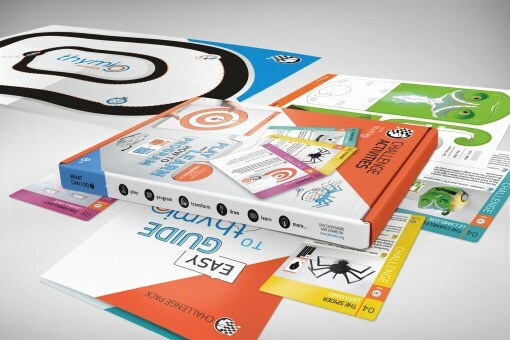 The Thymio Challenge Activities offers the same activities as the Thymio Challenge Pack. Attention, the Thymio Challenge Activities does not contain a robot nor a remote control! This product does not contain a Thymio robot!